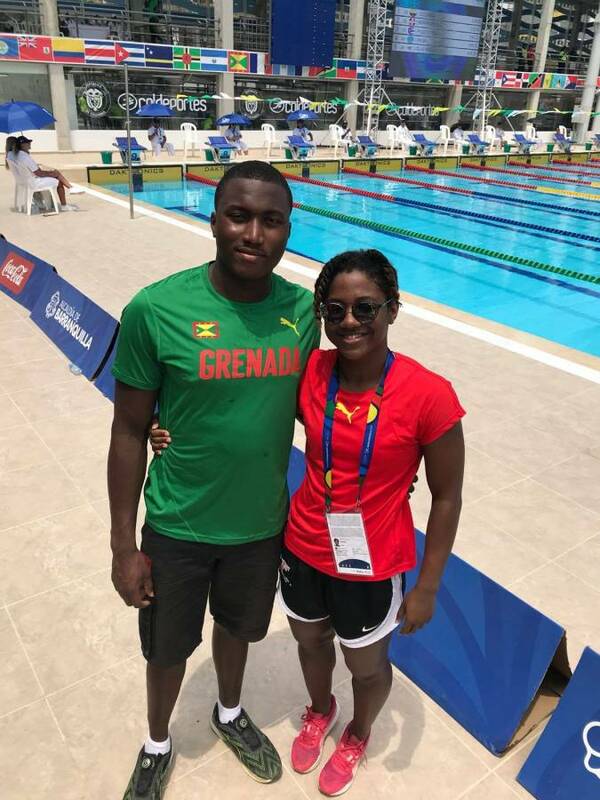 National Swimmers Delron Felix and Orelouwa Cherebin returned to Grenada on Friday, 27 July 2018 following an intense week of competition in Barranquilla Colombia at the Caribbean & Central American (CAC) Games. Although facing some intense competition our swimmers demonstrated their tenacity with strong swim performances and represented their country with distinction. Cherebin who competed in four events placing 1st, 3rd and 4th in her heats also made a B final in the 50 breast. Delron Felix once again put out an impressive showing with his qualifying performance in the 50 freestyle which earned him a 3rd place finish in his heat while once again achieving the qualifying time for the Youth Olympic Games carded for Buenos Aires in October later this year. Felix is the only Grenadian swimmer to have ever made the qualifying time that he has now accomplished twice, adding to his performance earlier this month at CCCAN in Aruba. Felix has been training at the Spire Institute in Ohio since January of this year and has been on a strong swim development track. Through assistance from FINA the world governing body for swimming, GASA has been able to facilitate this high-level training in support of his professional swim development. Felix’s recent performances are testament of the need to keep an eye on this young swimmer, as there is much more to come. Felix will recommence training next week in preparation for the Youth Olympic Games in October in Argentina. GASA and the entire swimming fraternity send out congratulations to these two swimmers who have done themselves and country well. They continue to lobby for better facilities to allow other swimmers with similar potential like themselves to achieve their full potential, it is the hope of GASA that this will be addressed in the shortest possible time.